A while back I promised to post a decent Laxmikant Pyarelal album; here's one that is such and more so. Technically this isn't my record as I bought it for and gave it to my girlfriend (guess what her name is), but she wasn't really into it so it ended up in my box - she doesn't mind though. Anyway, 'Anita'; a horror film I think, with a soundtrack to match. Lots of atmospheric things going on throughout, and a couple of great songs. Like the lovely Latin flavoured 'Karib Aa' and the more frantic 'Pichhware Budha Khansta'. There's plenty of dialogue on here as well... is it just me, or does the guy sound really sleazy? What puts this album on my list of favourites however are the two instrumentals - spooky bossa beats, creepy organs and massive John Barry-esque orchestrations - the second one in particular is truly amazing. Hello! Awesome blog! I'm loving the music! I was wodnering if you might happen to have any scores from any of the Ramsey bros. horror films? 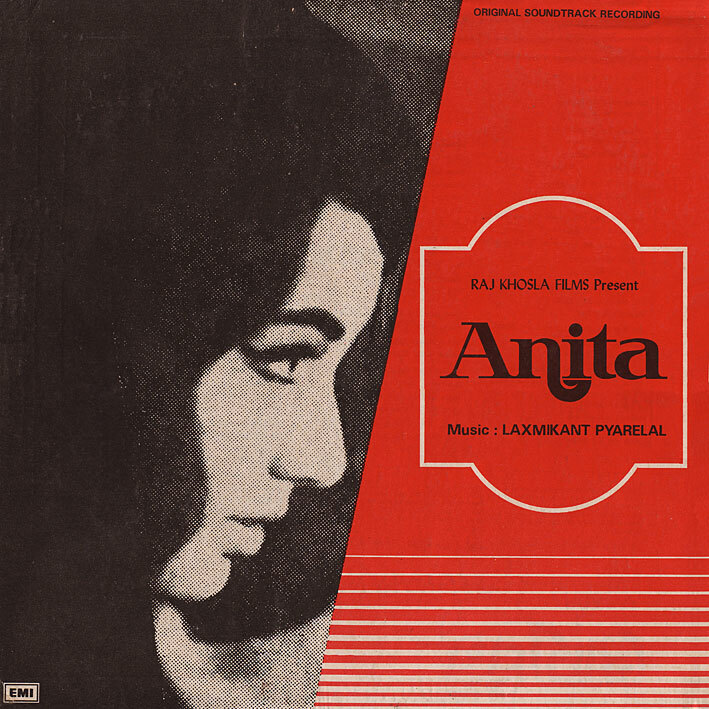 Great soundtrack - Manoj Kumar is the guy ... I guess in the dialogue he is more confused than sleazy as he is seeing yet another incarnaton of his beloved 'Anita'! Anyway - one of the big hot soundtracks from 1967 - especially 'Pichware Buddah Khasta'. So it's on DVD; cool, gotta get myself a copy! I've been meaning to comment on your excellent blog for some time. Thanks so much for sharing all of this wonderful music! The Anita theme tracks are fantastic! Thanks :-) And I like your blog! Thanks -- you always share the coolest stuff!